Megasal 2mg is a generic asthma medicine that contains one of the most popular drugs called Salbutamol. This medicine is advised to prevent and manage bronchial asthma and other respiratory issues similar to asthma. It is quite helpful in people with exercise-induced asthma caused by bronchospasm – constriction of airways in the lungs. It helps prevents asthma symptoms such as cough, breathlessness, wheezing and chest congestion. It provides short-term dilatation of bronchioles or airways in the lungs. It successfully manages asthma and other pulmonary issues associated with clinical features such as chest congestion, wheezing, coughing and dyspnoea (breathlessness). Also, it is a very good remedy for asthmatic patients who experience symptoms while performing exercise and who are exposed to allergens such as dust, pollen and pet dander. Megasal 2mg should be taken orally and it will not work right away after consuming Megasal 2mg pill. It is not effective when you experience a sudden asthma attack. For that, your doctor will suggest you to keep a rescue inhaler with you. During an attack, you need to use asthma inhaler in order to get rid of the suffering. Follow all directions while using Megasal 2mg pills. Take it by mouth for three or four times daily, or as advised by your physician. Irregular use of this asthma medicine will not help you, so make sure you use it regularly and aptly. Do not skip or miss the dose; if you do so, take it right away. Do not consume two doses at a single time to compensate the missed dose. 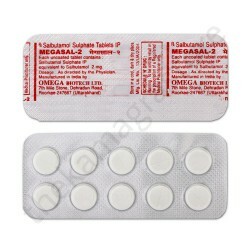 The active drug of Megasal 2mg is Salbutamol, also called Albuterol. It is probably the most prescribed asthma medicine. The drug works on the smooth muscles of the bronchioles or airways in the lungs. The bronchioles dilate and smooth muscles relax, thereby making breathing more comfortable and effortless. You must inform your doctor about the health issues you are suffering from and undergoing treatment before using Megasal 2mg. Also, inform about the medicinal allergies. This will help you use the medicine without any complexities. Special care should be taken when it comes to pregnancy and breast-feeding; ask your doctor for more details. Dizziness is often experienced after taking the dose, so stay away from activities that need attention. The plausible side effects associated with Megasal 2mg are tremor, nervousness, pain in head, dizziness and restlessness. They usually subside, but if they persist, immediately contact your doctor. Call your nearest medical practitioner if you experience chest pain, palpitations, skin rashes and swelling of the body.